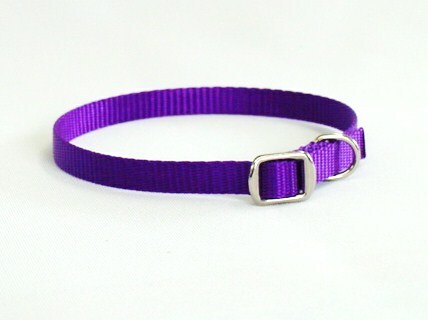 XS Dog Collar With Metal Buckle - $6.00 : Your Pet Store, Made in the USA! 3/8” wide nylon with an easy to use metal slide buckle. Simply slide the nylon through the buckle and you’re done—the nylon will not slip through the buckle once in place. Then, cut the excess nylon with scissors and heat the cut end with a lighter to seal the fabric. Total collar length is 14”, which fits any dog up to 20 lbs.